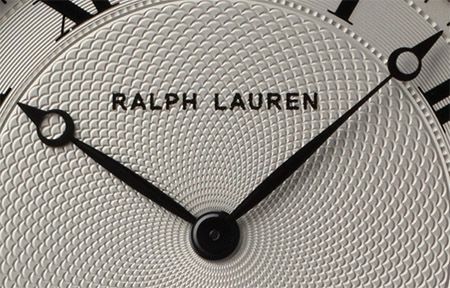 Last year, during SIHH2009, Ralph Lauren introduced a line of watches that definitely can be considered haute horlogerie. Some of the Ralph Lauren boutiques carried vintage watches (by Rolex, Patek Philippe etc) for quite some years now, but now they have their own impressive line-up. This year, Ralph Lauren introduces the Slim Classique Collection. So if you think that Ralph Lauren is fashion only, think again. 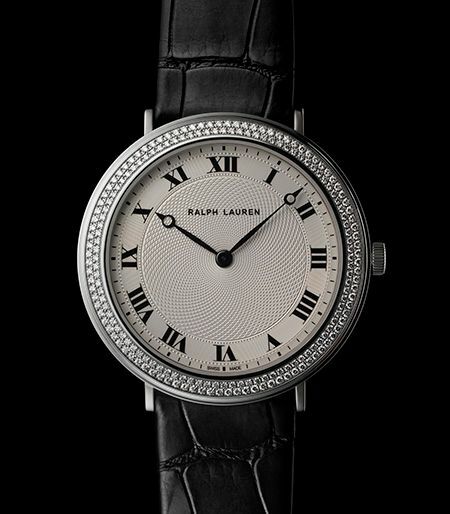 The Slim Classique is a 42mm diameter timepiece and only 5.35mm thick. Last week, I blogged about the thinness factor over at Vacheron Constantin with their Ultra-Fine watches but it seems that more brands follow this trend this year at SIHH (Salon International de Haute Horlogerie) in Geneva. The watch itself is available in rose gold, white gold and platinum (Pt950). The 192 diamonds (total amount of 1.11 carat) are optional for this wristwatch. Of course, you’ll wear this timepiece on a black alligator strap! Below a close-up of the guilloche dial and Breguet style hands. Prices are unknown at the time of writing this post. My guess is that they won’t come cheap and why should they? Although the brand name might remind most people about their Polo shirts, the used movement, used materials for case, crown and strap and the perfectly finished dial and hands are proof of the fact that they are really a true watch brand as well.